Not too long ago we wrote about a small CNC tool for automating certain parts of the woodworking process. At the time it seemed unusual in its intentionally limited scope but a few commenters mentioned it reminded them of another device, [Matthias]’s Pantorouter. It didn’t take much investigation to see that the commenters were right! The MatchSticks device does feel a bit like a CNC version of the Pantorouter, and it seemed like it was more than worth of a post by itself. The Pantorouter is a fascinating example of another small manual-but-automated tool for optimized for accelerating and improving certain woodworking operations. Every project deserves its own laser cut enclosure, of course, but the most common method of joinery – an overabundance of mortises and tenons, and if you’re lucky, a bit of kerf bending – is a little unsightly. Until tastes in industrial design change to accommodate this simple but primitive method of joining two laser cut panels together at an angle takes hold, the search will continue for a better way to cut acrylic and plywood on a laser cutter. 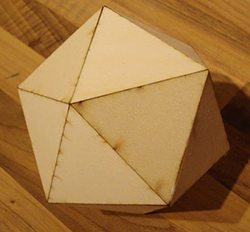 The folks at Just Add Sharks might have a solution to this problem, though: miter joints with a laser cutter. Instead of the slots and tabs of the usual method of constructing laser cut enclosures, miter joints produce a nearly seamless method of joining two perpendicular panels. The key, of course, is cutting a 45° bevel at the joint and gluing or fastening the pieces together. Just Add Sharks is doing this with a laser cut jig that holds a plywood or acrylic piece at a 45° angle to the laser beam. Yes, it’s only one cut per pass, but after adjusting the depth of cut to 1.4 times the thickness of the material, miter joints are easy. Using a laser for miter joints isn’t limited to 45°, either. There are a few examples of an octahedron and icosahedron. Of course fastening these mitered panels together will be a challenge, but that’s what clamps and glue are for.